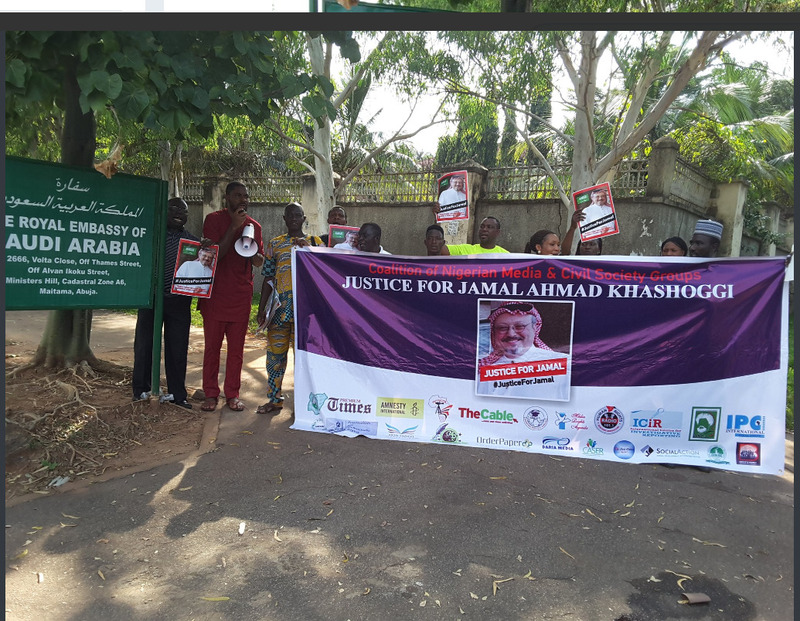 OrderPaperToday – Nigerian media and Civil Society Organisations embarked on a peaceful protest to the Saudi Arabian embassy over the death of journalist, Jamal Ahmad Khashooggi on Friday. Khashooggi was reportedly killed on the orders of the Crown Prince of Saudi Arabia, Mohammed Bin Salma, because the former’s writings were critical of his rule. The journalist was at his country’s Consulate in Istanbul, Turkey on the 2nd of October when the assassination took place. To express solidarity with the victim’s family and citizens of the Gulf country, protesters who converged at the embassy in Abuja, condemned the act, demanding for justice. The convener of the event, Peter Nkanga said: “We are gathered here to tell the people of Saudi Arabia that he deserves better than the blood thirsty government that kills the people at will, utter impunity. “No human being should never have to have such a bestial death. Jamal did not deserve to die, let alone in the one place where he should have felt safest in a foreign land, the Saudi Arabia consulate. “Jamal Kashoogi’s blood is crying for justice and that is why we are here. We are here to tell the Saudi government that injury to one is injury to all. His life and death would never be on vain. His blood will keep speaking for generations to come. His legacy will remain forever. Mr. Nkanga also took the opportunity to call on the Nigerian government to reopen investigation on the murder of all journalists killed in the country. He asked that the investigation be “impartial and transparent” and ensure their killers do not go unpunished.